It might surprise you to learn that lacrosse is Canada’s official summer sport – that’s right, it’s not all about hockey! This illustration shows a very early version of lacrosse played by the Iroquois people of eastern Canada and the U.S.
You also might be interested to know that lacrosse is a truly North American sport. It was first played by the indigenous Iroquois people, possibly as early as 1100 AD, hundreds of years before European contact. 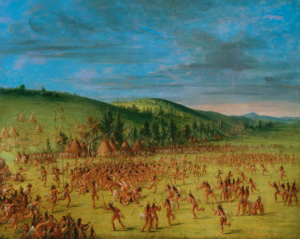 In the traditional, indigenous version of lacrosse, massive teams of 100 to 1,000 men played as warriors. This brought spiritual significance to the game that they played for the Creator. 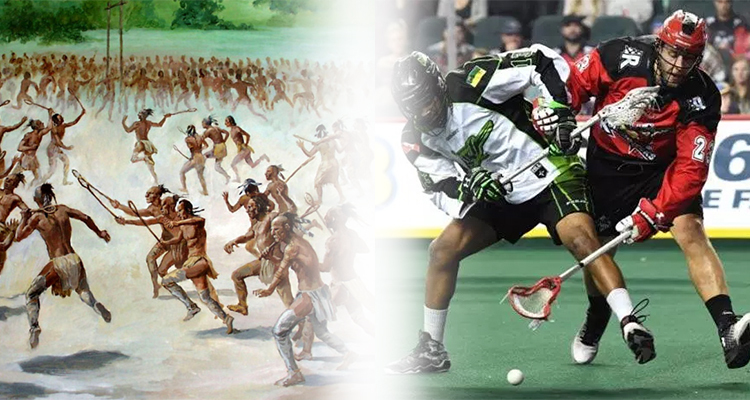 Much of what we know about lacrosse today is inspired by early Iroquois players. Today’s lacrosse is played at a variety of levels and is one of the fastest-moving, highest-scoring sports in the world. The rules described below apply to box lacrosse, a version that is played indoors during the winter. Box lacrosse is different from field lacrosse in speed and physical contact. Visit here to find out more about the differences between box and field lacrosse. Each game is made up of four 15-minute quarters. Players wear gloves, elbow pads, shoulder pads, helmets, and carry a stick, depending on what position they play. Two teams of six players (one goalie and five runners) play against each other to score a goal. Scoring is achieved by sending the lacrosse ball (similar to a tennis ball) into the other team’s net. The team with the most points at the end of four quarters wins. Lacrosse players wear a variety of equipment, including elbow and shoulder pads and helmets. send the ball forward to the other side of the court within 10 seconds of receiving the ball. This means that there’s very little time to be still and think about your next move. With all of this action, player contact is unavoidable. As in hockey, fights are permitted between players, but are usually broken up quickly. Adding to the thrill of the speed of the game is the environment it is played in. During the winter, modern box lacrosse is played indoors in converted hockey arenas. The ice surface is covered over with turf so that lacrosse can be played on the rink. This means that lacrosse offers the same high energy environment as hockey, with lots of lights, loud music, and cheering. Attending a lacrosse game is the perfect way to introduce your family to Canadian sport! After all, tickets are much more affordable than hockey, often running for $30 or less per person. 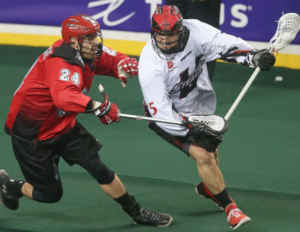 Calgary has its own lacrosse team: the Calgary Roughnecks, who play in the National Lacrosse League. Home games are held at the Calgary Saddledome (also the home of the Calgary Flames) throughout the winter. View the video below to see the Roughnecks in action, and visit the Roughnecks’ webpage here.